Until the Second World War, each year’s editions of Boy's Own Paper had been available bound together as The Boy’s Own Annual. From 1957 to 1966, under Lutterworth Press auspices, Jack Cox produced several compendiums under the titles The Boy’s Own Book of Hobbies (two editions) and The Boy’s Own Companion (five editions). Many of these included articles by Gilbert Davey. 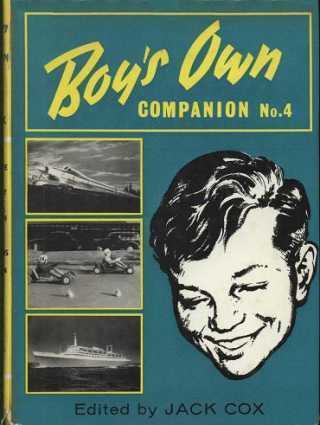 Dust jacket of Boy's Own Companion No.4, 1962. Copyright © Lutterworth Press; reproduced by kind permission. Meanwhile in May 1963, the Boy's Own Paper had been taken over from Lutterworth Press by Purnell & Sons. Under Purnell's auspices, the Annual title was revived in 1964 and, like the Companion that preceded this revival, featured reprints of popular articles and stories from BOP (as long as the parent publication lasted). Unlike the Companion's small fabric hardback format, the new Annual was in large format with glossy illustrated boards. It is often asserted, notably by Davey and Cox themselves, that the Annual was revived in 1959; however the 1964 edition as below is referred to as "the first of its kind since 1939" on the Editor's page (borne out by subsequent numbering). They clearly viewed the Companion as the practical beginning of the revived Annual. In 1966, a second Boy's Own Book of Hobbies appeared from Lutterworth Press, entitled thus on the spine, but as the Boy's Book of Hobbies on the title page and page headers. This appears to be an incomplete implementation of an agreed - or forced - title change, presumably because Lutterworth Press no longer owned the rights to the Boy's Own titles. In February 1967, the last edition of Boy's Own Paper appeared, and the Annual remained as the sole embodiment of the Boy's Own title. Gilbert Davey's designs were often revised between their first appearance in BOP and re-appearance later. This means that it is not always possible with certainty to link designs from BOP with designs as they appear in the offshoot publications. The anomaly in the title for the 1966 edition has been noted above. History, circuit symbols, tools, workspace, aerials, earths. periodicals, kits. Transistors mentioned as needing developmemt. DAF91, DL94; phones or output transformer and speaker. other end carries amp on tag-board. 2 x OC71; speaker 75Ω or earpiece. Numbers 1 (1959), 2 (1960), 3 (1961) contain no articles by Davey. Reprint of BOP article, June 1961. Davey coil download on CONSTRUCTION RESOURCES page. 1T4 (or DF91, DF92, DF96). Reprint of set in BOP Oct 1962 Gift Supplement. Note: the numbering and naming of successive editions of the new Annual was erratic, and the safest course is to look at the year appearing next to the copyright (©) symbol, usually on the front endpaper or flyleaf. These are the years quoted in bold type on the left in the list below. I have also briefly described each Annual's front cover as a further aid to identification. The Annuals published in 1970, 1971, 1973, 1974, and 1975 contain no articles by Davey. "Lady Jayne" heat sink idea. Reprint of BOP Feb 1965 article. EF80 (lantern battery for 6v LT); headphones. Reprint of BOP Apr 1964 article. Driver and output transformers, speaker. Combined reprint of BOP Jul 1966 and Oct 1966 articles. Rotary wafer switch 2 x 3-pole 3-way. Use with Pegasus receiver suggested. A further circuit using two relays is given, but is not described. 1971 Missing from British Library collection. Checked by purchase. Includes circuit for a transistor tester. Unattributed, author unverified. Uses 5mA meter, resistors, battery. CONTACT ME As far as I know, the Boy's Own Annual carrying the copyright year 1975 was the last to appear, so this list of BOP offshoot publications should now be complete. Unless you know otherwise . . .